I consider myself equal parts veterinarian, mountain biker and artist. 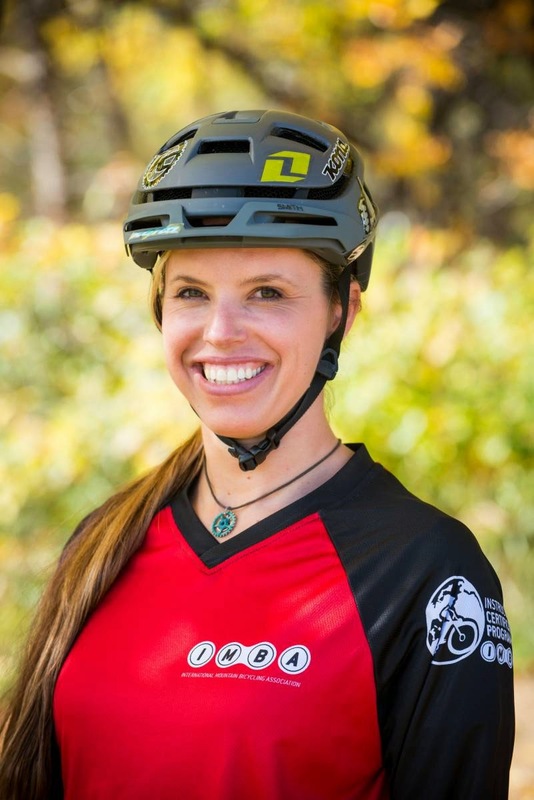 I found my passion for all things mtb after reaching the goal of becoming a veterinarian. I think that after spending so many years working out my brain, I embraced the physical challenge & adventure of mountain biking. I figure art will play a bigger role in the next phase. Rather than waste time wishing I found biking sooner, I'm just glad I found it! I don't remember spending much time on bikes as a kid, but I know I had one- with banana seat. I bought my first hybrid mountain bike for occasional commuting in grad school. That endeavor put me on some dirt paths alongside the river, which ignited some deep desire to mountain bike. With no clue of what I was doing, I started what some people might call mountain biking in 2000. While the woods and the exercise were my earliest motivations, I soon learned to appreciate the challenge and sweet reward of accomplishment... and that intoxicating adrenaline rush after tackling something scary. Racing inspired me to increase my saddle time exponentially. I admire people who get out and ride several times a week just because they enjoy it, but for me it's setting my sites on a competition that gets me out there rainy days. I competed the first year I mountain biked, in triathlons to emulate a friend I admired. Within a year I realized the biking part was my favorite and I soon met some mountain bikers, including my now husband, who helped me along that path. I enjoy competing because it drives me to be more fit and continually improve my skills. Further, competitions bring me to new and amazing places and new and lasting friends. It's great to get out among like minded people. I started out in XC and then added endurance events like La Ruta. 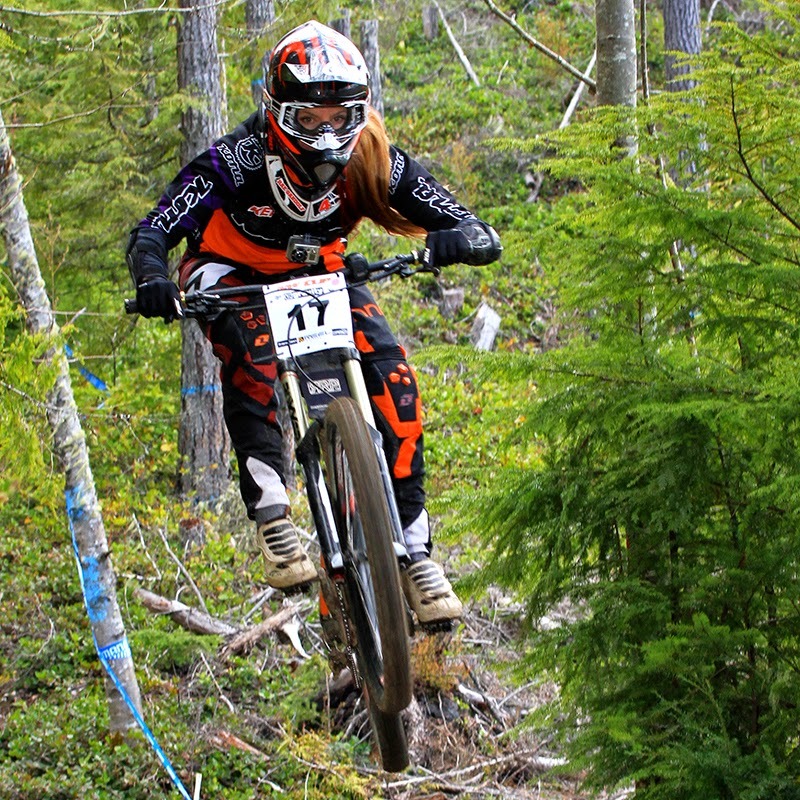 I wouldn't trade those grueling experiences for anything, but I've been hooked on DH ever since my mind was blown seeing my first event- pro women racing NORBA nationals on Snowshoe mountain. I enjoy the technical riding and high intensity interspersed with line analysis, sessioning, and socializing. Enduro is a fun place in the middle that embodies the type of cross-country trail riding & racing I prefer- pedaling uphill non-tech sections at a cruising pace then rallying what you have to keep momentum when it counts, and cruising while you relive the bobbles and triumphs with your buddies until the next section. I love what can be done on a DH bike - jumping 50 feet or dropping 10 feet down to flat, but I have to travel for that. With the help of some members of our small mtb club, my husband and I build trails to our liking- enduro friendly with jumps and tech that continue to challenge us. I can session pretty much all day long, pushing back up to try and perfect landings or get more air....that's probably why I also love riding dirt parks or indoor parks like Ray's. I felt like I'd died and gone to heaven when I visited Valmont Bike Park this year! Accomplished but in over my head! If you’re nervous what do you do or think to overcome it? I try to cram the nerves into a pocket and I think about how awesome it's gonna feel after I conquer the section. Then I start pedaling and commit, commit, commit. I went to clipless almost immediately after a brief time on in toe clips. Now I go back and forth (ie. flats for dirt jumping and some off season training, clipless for race season). My advice is don't ever use toe clips and if you want to go clipless, invest in good clips to start. They will make your experience easier and help you to avoid some "clipless moments" like when you fall over because you can't unclip. But then what will you have to laugh about over beers afterward? 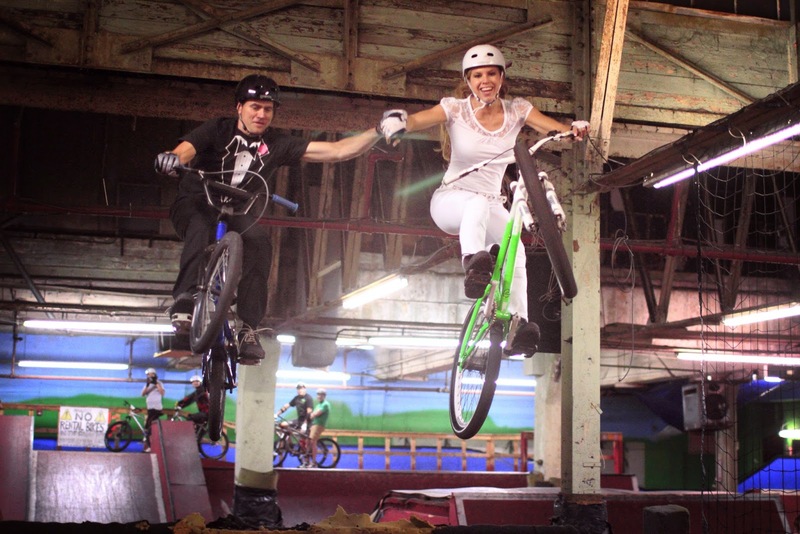 "Ray's indoor mtn bike park has brought so much joy our lives that my husband and I got married there!" Hahaha! Haha! Ok, I'm not sure a number exists for the amount of biffs I've had! I always try to laugh if it doesn't hurt, if it damages the bike I try to be thankful that it was the bike and not me, if it hurts I try to be thankful that it wasn't more serious and I "pedal it off" when I'm ready, and if it requires medical attention....well I could still use improvement on that one but focusing on the things that I can do when I'm injured definitely helps. I love how riding technical terrain forces me to live in the present, and I love the excitement and pure happiness that jumping brings me. I also love when the perfect ride group comes together, creating an awesome social event. 1. Kona Operator carbon- my tried and true DH bike because I have immense respect for the company and the bike. 2. "Han Solo" a Santa Cruz 5010 that I use for trail riding and enduro racing because it's got fantastic pedal efficiency and geometry and just enough travel for nasty rock sections and slightly miscalculated landings, and my husband sells them so it's a demo bike. 3. A Santa Cruz Jackal for dirt jumping and indoor park riding because it is light, has great jump geometry and is set up for single speed. 4. A Kona Rove cyclocross bike for the occasional pure road rides because it pedals great and is comfortable - I've never gotten comfortable on a road bike. 5. A Specialized rock hopper hard tail (my first mountain bike). I use it for gravel riding, it doesn't see trail anymore. 6. A Redline stationery bike with customized handlebars so I can sit more upright and have a mtb posture, because it's completely quiet and girl's gotta get through Ohio winter somehow. 7. A 26 inch frame transformed into a trampoline bike. I use it to work on aerial awareness and I hope I can flip it one day! 8. A Bridgestone 26 inch rigid, because it's a funny conversation relic. I call it the "skid bike" and use it to practice skidding down my road and bring it to races to use on my wind trainer for warming up. 9. I hope to get a slope style bike this year because I'm a spoiled rotten mountain biker and I want the perfect bike for every discipline! #1-3. Seat dropper post - one with a handlebar remote so you don't have to sit down on in order for it to come up (ie. Kind Shock). #4. Lakes winter shoes- for any trail riding below 40 degrees, helps keep you on the trail all year round! I'm not sponsored by either one of those! Tell us about TheSisterhood of Shred and how you became involved? I have made some great friends all over the country through mountain biking. Some of the closest were involved with the development of the Sisterhood of Shred and so kindly embraced me! What has been the most rewarding thing since joining The Sisterhood? Kat Sweet came out to instruct an IMBA course here in Ohio with me and I got to show her around some of our trails. She really enjoyed the trails and had just as much fun filming me for a project. It was so much fun to not only to ride "my" trails with her but to feel like our trails and my riding were worthy of her getting the video camera out! Why is The Sisterhood so important to you? Being a female mountain biker, never mind pro downhiller, in Ohio has its unique challenges. Aside from the obvious (we have no mountains), women who can relate to my passion are few and far between. Just knowing that there are these incredible ladies who understand me and are only a text away really helps me to stay confident and focused rather than questioning my pursuits and dreams. There's always someone out there to say "Go for it, I believe in you!" and that's amazing. What changes to your life have come from being involved with such a positive group of women? Getting these rad women in my life has opened so many doors through networking. I wouldn't be on the Kona Super Grass Roots Team without this community or have landed an incredible job this year as an Instructor Trainer for IMBA's Instructor Certification Program. What has it been like to learn and ride from other women vs. men (being mountain biking is so men-based?) What are the positives that you've had from female coaching/encouragement? My first women's event was at Ray's MTB park several years ago. The experience was unexpected, mind opening and unmatchable. There is this unique energy that forms when women all get together for the sake of riding, having fun and improving- we have immense influence one another and the capacity to reach our potential expands dramatically. I owe the brunt of my technical improvement to a gifted male coach, Shaums March. That said, there is something extra about having a great female coach. Mountain biking is a different experience for men than it is for women and that's something a female can innately understand. What do you feel deters women from getting involved with cycling? Especially mountain biking. Let's face it, mountain biking isn't the sexiest sport and plenty of women just don't want to look sweaty or get dirty or risk injury. For anyone who can get past that and has even the smallest desire to try, that's a mountain biker in the making. After they give it a try and get interested, lack of riding buddies is a big limiting factor for women who are in the early phases and not quite ready to join the local ride group. Theoretically we are working to help change that. More coverage of women's divisions in competitions would give women something to aspire to or simply show it as something women do! You can't come up with the idea to start mountain biking unless something sparks it. The wonderful things mountain biking has brought to my life make me want to share it with others. Does everyone love to give advice to people about something they feel that they struggled through the hard way and learned so much in the process about how to make it easier for the next person? That's why I particularly enjoy coaching women, I feel like I can help them to get farther faster (figuratively and literally!). I'm published in areas such as eye ulcers in rhinos and electrocardiograms in brown bears.